Before going into any discussion about how to correct any chemical imbalance of your pool water, you need to know how to calculate the number of gallons in a pool. Online calculators are not very specific to unusual pool shapes and won’t always give you the number of gallons in a pool accurately. So, if you want to be accurate, it may be best to calculate the number of gallons in a pool the old fashioned way. It doesn’t take long and with a piece of paper and and a bit of know-how. I’ll go over some basic math and how to apply it to most common pool shapes. It’s easy. It can be tricky especially if you have an irregular shaped bottom, like what you may have with an oval or free-form shaped pool. But you can simplify everything by measuring the depth in several spots, making sure that one measurement is the deepest spot and another is the shallowest spot. If you measure in 4 places, say, then add up all your depths and divide by 4 (the number of places you measured). You will have a very good average depth this way. The simplest way to average out your pool depth is by measuring the deepest and the shallowest spots, adding those 2 together, then dividing by 2. You can try it both ways and you’ll probably come up with very similar numerical answers. 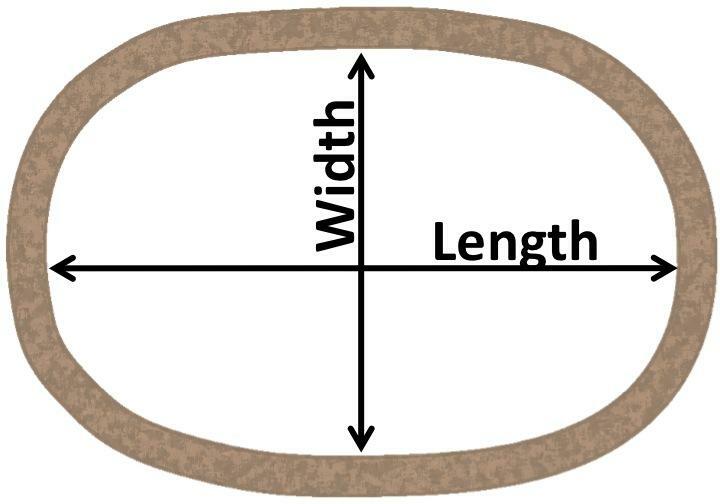 If your pool has a Roman or Grecian shape, make sure you measure the longest length and the width, then multiply by your average depth and then by about 7.3 (instead of 7.5) and you’ll compensate for the corners fairly close. If the bottom is like a bowl, you may want to check a few spots to find the average depth. If the bottom is squared to the sides, one measurement is all you need. Be sure and measure the 2 widest places in the kidney shape then divide by 2 to get an average width for your formula. This is the exact same formula as for any rectangle shaped pool. Simply view your pool as 2 separate rectangles, do the math, and add the two capacities together. Most free-form shaped pools are really basically an abstract form of a common shape. Notice in the drawing to the right how this free-form is really just an abstract oval. You can work out the averages and use the formula for an oval and you’ll get very close. Another even more accurate way to calculate a free-form shaped pool is to plot it out onto a sheet of graph paper. Make it to scale so you can count the squares that make up your pool. Calculate one square using the rectangle formula and multiply your answer by the total number of squares on your paper. When adding up squares on your graph paper, count the ones that make up more than half of a square, and don’t count the ones that make up less than half a square to get a very close average of the whole. Take your time and get as close as you can to the actual capacity of your pool in gallons. Do it once and you’ll always know. If you know who your pool builder was, they may have the digging diagrams or specifications on file, and they can tell you your exact pool water volume. Once you know exactly how to calculate the number of gallons in a pool, it’s always a good idea to round up the number to the nearest thousand gallons when engaging in conversation with anyone about chemical additions. Just an aside; it’s safe to say that the average size of an in ground pool is about 15,000 gallons.